One hearing of this CD is enough to convince the listener that these works of exquisite beauty should be striding with the giants of Romantic violin works—Brahms, Elgar, Franck et al. It is astonishing how two such works could escape 'standard' repertoire recognition for over a century, and Philippe Graffin, together with pianist Pascal Devoyon, clearly relish the warm, passionate, singing melodic lines and harmonies permeating these pieces. Disinclined to favour one movement from the others, it has to be said that the Andante sostenuto from Goldmark's Suite is possibly one of the most heartrending slow movements ever written, played with such compelling beauty and conviction that this interpretation will prove to be the benchmark recording for many years to come. Bruno Walter and Karl Goldmark have little in common other than their Jewish birth; from then on they led very different lives. Goldmark was born – on 18 May 1830 in Keszthely, Hungary, on the south-western tip of Lake Balaton – as one of twenty children (perhaps as many as twenty-three) born to the local cantor and lawyer Ruben Goldmark and his wife Maria. Only eleven of the children were then still surviving. Bruno Walter saw the light of day on 15 September 1879 in a comfortable, middle-class family in cosmopolitan Berlin. Goldmark struggled against the odds to establish himself as a composer and succeeded; Walter entered the Stern Conservatory in Berlin at the age of eight where he was pampered as ‘the little Mozart’ and abandoned composition in his twenties when his music didn’t live up to his own standards. Their paths did cross on 2 January 1908 when Walter presented the world premiere of Goldmark’s sixth, and last, opera Ein Wintermärchen, based on Shakespeare’s A Winter’s Tale. He had already conducted Goldmark’s first opera Die Königin von Saba (‘The Queen of Sheba’) during his two-year term (1898-1900) as conductor of the opera in Riga. In 1834 Goldmark’s family, which had its origins in western Galicia, moved to Deutsch-Kreuz, some seventy kilometres due south of Vienna and right up against the current Hungarian border. Although the Goldmark children were familiar with the music of the synagogue, their sheer number combined with their father’s modest means to rule out systematic musical instruction; it was only in 1841 that Károly (he adopted the German form of his name in his teens) was first taught the rudiments of music, in the form of violin lessons from a singer in a local choir. But his talent was immediately obvious, and the next year he travelled to the nearest large town, Ödenburg (today Sopron, in Hungary) to attend the school of music there. His progress was rapid and so, in 1844, his father packed him off to join his elder brother Josef in Vienna. There he studied for a year-and-a-half – until he ran out of money – with Leopold Jansa (1795-1875) who had taken over the position of first violin in Ignaz Schuppanzigh’s quartet after the death of its founder. Nothing daunted by his poverty, Goldmark taught himself what he required to enter the Vienna Technical School and, thereafter, the Conservatoire where he studied violin with Joseph Böhm (1795-1876). That put him in direct descent from no lesser a violinist than Arcangelo Corelli, in an impressive teacher-student genealogy: Corelli – Somis – Pugnani – Viotti – Rode – Böhm. Among Böhm’s other well-known students were Joseph Joachim, Heinrich Erst, Leopold Auer, Georg Hellmesberger and Adolphe Pollitzer (who, in London in 1877, became the violin teacher of one Edward Elgar). With the wave of revolutions that wracked Europe in 1848, the Conservatoire was closed and Goldmark returned home to Deutsch-Kreuz – wisely: with his brother Josef, he seems to have been involved in revolutionary activities (or at the very least, he was mistaken for someone else who was) and was nearly shot. He now earned a living by playing in the theatre orchestra in Ödenburg, also making his first solo appearances there and in Buda. In 1851 he was back in Vienna, playing at the Josephstadt Theatre and the Carlstheater, all the while composing and working away at improving his technique. Goldmark first presented himself to the Viennese public as a composer in 1858 with a concert of chamber music and songs, but the reaction was tepid and he withdrew to Pest to eke out a living as a teacher while he continued his autodidactic mission with musical textbooks and exhaustive study of the works of Bach, Mozart, Haydn and Beethoven. A second concert in Vienna a year later had a warmer reception, encouraging a move back there, this time for good. The premiere of Die Königin von Saba at the Vienna Court Opera in 1875 set the seal on his reputation. It enjoyed considerable international success; indeed, it was the first German opera, apart from Wagner, to be performed in Italy. His status was assured (despite occasional anti-Semitic jibes – even a short book written in his honour by Otto Keller in 1902 refers to Goldmark’s family slightingly as ‘israelitisch’). He was a friend of Brahms and Johann Strauss, an esteemed teacher (Sibelius was, briefly, one of his students) and he lived out his days in Vienna as one of the most respected figures in the musical life of the city, and of the Austro-Hungarian Empire in general. He died in Vienna on 2 January 1915. It might seem strange that Goldmark wrote so little for his own instrument, the violin, if it were not for the relative brevity of his work list. His best-known score is his Concerto in A minor, Op 28, published in 1877 and latterly a favourite of Heifetz and Milstein. On a smaller scale, there are two suites, No 1 in D major, Op 11 (published in Mainz in 1869), and No 2 in E flat, Op 43 (Berlin, 1893); there are also a D major Sonata, Op 25, of 1874, published in Mainz the following year, and a Ballade in G and Romance in A, both appearing in Vienna in 1913. The Suite in D was plainly composed under a classicising impulse, perhaps responding to the archaising mood put about in Austro-German music by Adolf Jensen’s Deutsche Suite, Op 36, written at some point in the 1860s. The English scholar and composer Harold Truscott identified Jensen’s work – in effect, a Baroque French suite, despite the name – as having injected the spirit of the seventeenth century into the middle of the nineteenth. Jensen’s suite would have been a very recent memory when Goldmark sat down to write his; whether or not the influence is direct, the impress of the Baroque on Goldmark’s Op 11 is plain to hear: an Allegro overture (E major), a Bachian Andante sostenuto (in the relative minor, C sharp), a gentle Allegro ma non troppo (E major again) that replaces the minuet with the waltz, a wistful and rather more modern Allegro moderato quasi Allegretto (A major) and a buoyant finale, marked Allegro molto (E major), where the principal melodic idea is what the Germans call an Ohrwurm, an ear-worm: once heard, it’s not readily forgotten. ‘I am not a composer’, Bruno Walter writes emphatically in his autobiography, Theme and Variations (Hamish Hamilton, London, 1947, page 185). Indeed, apart from a fleeting reference to an unfinished operatic project, Agnes Bernauer (undertaken when he was sixteen), Walter lets almost two hundred pages of his memoirs slip by before he broaches the subject of his own music. No one seems yet to have attempted to catalogue the few compositions Walter did write. He eschews the task in Theme and Variations, as do both recent biographies, Michele Selvini’s Bruno Walter: La porta dell’eternità, 1876-1932 (privately published, Milan, 1999) and Bruno Walter: A World Elsewhere by Erik Ryding and Rebecca Pechersky (Yale University Press, New Haven and London, 2001). It seems that Walter first put pen to music-paper at the age of nine, producing a duo for violin and piano as a birthday present for his father, and he continued to compose throughout his teens. The bulk of his early output consisted of songs, of which most are now lost, probably destroyed by their creator. Two sets of six songs each were published in 1901 or early 1902 as Opp 11 and 12, although at least two of the songs date from as early as 1890. (The opus numbering, of course, points to the existence of at least ten other scores.) In March 1893, while still a student at the Stern Conservatoire, he conducted his own setting of Goethe’s Meeresstille und glückliche Fahrt for chorus and orchestra, and he seems to have set Hermann von Gilm’s Allerseelen in 1896. In 1903 he wrote a string quartet in D major, premiered by the Rosé Quartet in November of the same year. In the following May he conducted a Symphonic Fantasy inspired by Ibsen’s Peer Gynt (although he joked that its content was autobiographical enough to merit the title Bruno Walter) at the festival of the Allgemeiner Deutscher Musikverein in Frankfurt am Main. That summer he set to work on a piano quintet and played the piano part – he was an excellent pianist – with the Rosé Quartet in the premiere in February 1905 and, again with members of the Rosé Quartet, he give the first performance of his Piano Trio in January 1907. The next two works, both written in 1907, were on a larger scale altogether: a setting of Schiller’s Das Siegesfest for soloists, chorus and orchestra, and a First Symphony, in D minor, some 55 minutes in length – it was first performed in Grosser Musiksaal in Vienna on 6 February 1909, with the Konzertverein Orchestra conducted by the composer. The public loved it; the critics’ reactions were mixed. Six more songs, all Eichendorff settings, were published in 1910. In Theme and Variations Walter mentions a Second Symphony (in E, 1909/10) and Das Siegesfest but adds laconically (page 186) that ‘I no longer tried to have them performed. My doubts concerning my creative ability had become certainty. Only a piano-and-violin sonata, dedicated to Arnold Rosé, managed to outlive my renunciation for several years, probably because of its andante, for which I still have a certain fondness’. That ‘piano-and-violin sonata’ – interesting that Walter should bill the piano first, as was conventional when the violin sonatas of both Beethoven and Brahms were published – was first performed on 9 March 1909. The style suggests that Walter may have been familiar not only with the Brahms violin sonatas (hardly surprisingly), but that he may already have come across the music of the then nine-year-old Wunderkind, Erich Wolfgang Korngold. He certainly knew Erich’s critic father, Julius, who had regularly dismissed Walter’s compositions in the Neue Freie Presse; and in 1908, according to Julius Sternberg, a fellow Viennese critic, Walter moved into a flat in the Theobaldgasse, downstairs from the Korngolds, where he could hear the young Erich indulging his imagination at the piano. The expansive first movement of Walter’s Violin Sonata, marked Allegro con espressione begins in a confident A major but its complicated motivic development – based on a knocking shape that looks and sounds rather like a retrograde inversion of Beethoven’s ‘fate’ motif from the Fifth Symphony – soon begins to manifest considerable tonal instability as it modulates through C, A flat, F sharp minor, C sharp major, D minor, E flat major and F sharp minor, sometimes for only the briefest of moments, before eventually settling on A major. The Andante serioso second movement, which sets out in F sharp minor, threads the three-note tail of the knocking figure through an argument that shows only slightly more tonal stability than the first movement: G major, F sharp minor, B flat major, A major, D major, falling back into an uneasy F sharp minor. The Moderato finale sets out in A minor, which manages to withstand the efforts of a dropping figure to de-stabilise it and thus opens out into a passage marked calmo, in the relative major, C. But it doesn’t stay calmo for long, in mood or tonality, swinging through A flat major and E major before returning to A minor with the indication of Tempo primo. Warmer keys predominate for the rest of the movement – G major, E major, B major – until the music sinks into an E minor coda, which returns to A minor for its closing bars. 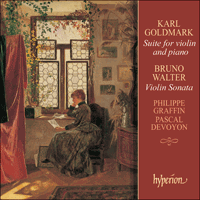 Bruno Walter et Karl Goldmark… Qu’ont-ils en commun ? Peu de choses, si ce n’est leur origine juive. Goldmark naquit le 18 mai 1830 à Keszthely, en Hongrie, sur la pointe sud-ouest du lac Balaton, dans une famille de vingt enfants, peut-être même 23, du chantre et avocat local Ruben Goldmark et de sa femme Maria. Seuls onze des enfants survivront. Bruno Walter vit le jour le 15 septembre 1879 au sein d’une famille bourgeoise confortablement installée dans le Berlin cosmopolite de l’époque. Goldmark se battra envers et contre tous pour établir sa notoriété en tant que compositeur et sortira vainqueur de sa quête ; Walter entrera au Conservatoire Stern de Berlin à l’âge de huit ans et sera cajolé et rebaptisé « le petit Mozart », il abandonnera la composition à vingt ans lorsque sa musique ne sera plus à la hauteur de ses attentes. Les routes des deux hommes se croiseront pourtant le 2 janvier 1908 lorsque Walter présentera la première mondiale du sixième et dernier opéra de Goldmark, Ein Wintermärchen, d’après le Conte d’hiver de Shakespeare. Il aura déjà dirigé le premier opéra du compositeur, Die Königin von Saba (La Reine de Sheba) dans le cadre de son contrat de deux ans, de 1898 à 1900, à la tête de l’opéra de Riga. En 1834, la famille de Goldmark, dont les origines étaient de Galicie de l’ouest, partit pour Deutsch-Kreuz, à quelque soixante-dix kilomètres au sud de Vienne, tout contre la frontière hongroise actuelle. Les enfants Goldmark connaissaient la musique de la synagogue, mais leur nombre et les moyens modestes de leur père força ce dernier à renoncer à tout enseignement musical ; ce n’est qu’en 1841 que Károly (il n’adoptera la version allemande de son nom qu’à la fin de l’adolescence) reçut pour la première fois les rudiments de la musique, sous forme de leçons de violon dispensées par un choriste local. Son talent éclata cependant très vite, et l’année suivante, il partit pour la grande ville la plus proche, Ödenburg (de nos jours Sopron, en Hongrie) pour étudier à l’école de musique qui s’y trouvait. Devant les progrès rapides du jeune garçon, son père l’envoya rejoindre son frère aîné, Josef, à Vienne, en 1844. Il y étudia pendant un an et demi, jusqu’à ce que l’argent vienne à manquer, avec Leopold Jansa (1795-1875) qui avait repris le poste de premier violon dans le quatuor d’Ignaz Schuppanzigh après le décès de son fondateur. Décidant que la pauvreté n’aurait pas raison de lui, Goldmark s’enseigna ce dont il avait besoin pour entrer à l’Ecole Technique de Vienne, puis au Conservatoire où il étudia le violon avec Joseph Böhm (1795-1876). Il suivit ainsi les traces du prestigieux violoniste Arcangelo Corelli dans une lignée impressionnante de maîtres et d’élèves : Corelli - Somis - Pugnani - Viotti - Rode - Böhm. Böhm comptait également de célèbres élèves tels que Joseph Joachim, Heinrich Erst, Leopold Auer, Georg Hellmesberger et Adolphe Pollitzer (qui devint en 1877, à Londres, le professeur de violon d’un certain Edward Elgar). La vague de révolutions qui s’abattit sur l’Europe en 1848 força malheureusement la fermeture du Conservatoire et le retour de Goldmark à Deutsch-Kreuz. Sage décision : Josef et lui furent apparemment impliqués (ou confondus avec des hommes impliqués) dans des activités révolutionnaires, et Goldmark manqua de se faire tuer. Il vécut alors de ses performances dans l’orchestre du théâtre d’Ödenburg où il fit ses premières apparitions en solo, ainsi qu’à Buda. En 1851, de retour à Vienne, il joue au Josephstadt et au Carlstheater, sans jamais cesser de composer et d’affiner sa technique. Goldmark se présentera pour la première fois au public viennois en tant que compositeur en 1858 avec un concert de musique de chambre et de chansons, mais l’accueil sera tiède et il décidera de se retirer à Pest pour y enseigner d’un côté, et poursuivre sa mission autodidacte de l’autre, à l’aide de cahiers musicaux et en étudiant à fond l’œuvre de Bach, Mozart, Haydn et Beethoven. Un deuxième concert à Vienne un an plus tard l’encourage à y revenir, cette fois pour de bon. Mais la consécration arrivera par La Reine de Sheba à l’opéra de Vienne en 1875. L’œuvre jouira d’un immense succès international et sera même le premier opéra d’une compositeur allemand, à part Wagner, à être interprété en Italie. Son statut est alors assuré, malgré les attaques occasionnelles anti-sémites (même un petit livre écrit par Otto Keller en 1902 en son honneur parlera de la famille de Goldmark comme assez « israelitisch »). Ami de Brahms et de Johann Strauss, professeur estimé (Sibelius sera, pendant peu de temps, l’un de ses élèves) il finira sa vie à Vienne comme l’une des figures les plus respectées du cercle musical de la ville et de l’empire austro-hongrois en général. Il décède à Vienne le 2 janvier 1915. Il peut sembler étrange que Goldmark ait écrit si peu pour son propre instrument, le violon, mais il suffit de regarder la liste de ses œuvres : elle est relativement brève. Sa composition la plus connue est son Concerto en la mineur, Op 28, publié en 1877 et devenu par la suite l’un des concertos préférés de Heifetz et de Milstein. À une moindre échelle figurent deux suites : la Suite nº 1 en ré majeur, Op 11 (publiée à Mayence en 1869) et la Suite nº 2 en mi majeur, Op 43 (Berlin, 1893) ; il faut aussi noter la Sonate en ré majeur, Op 25, de 1874, publiée à Mayence l’année suivante et une Ballade en sol ainsi qu’une Romance en la, qui apparaîtront toutes deux à Vienne en 1913. La Suite en ré a été composée dans un élan résolument classique, en réponse, peut-être, à l’atmosphère d’archaïsme introduite dans la musique austro-allemande par Deutsche Suite, Op 36, d’Adolf Jensen, écrite dans les années 1860. Le savant et compositeur anglais Harold Truscott identifiera cette œuvre de Jensen – suite baroque française en fait, malgré son nom de Suite allemande – comme ayant insufflé l’esprit du dix-septième siècle au cœur du dix-neuvième. La suite de Jensen ne serait pas loin dans la mémoire de Goldmark lorsqu’il composera la sienne ; que l’influence soit directe ou non, la marque du Baroque s’entend clairement dans l’opus 11 de Goldmark : ouverture Allegro (mi majeur), Andante sostenuto portant la patte de Bach (dans la tonalité relative de do dièse mineur), Allegro ma non troppo doux (de retour en mi majeur) qui remplace le menuet par la valse, Allegro moderato quasi Allegretto mélancolique et plus moderne (la majeur). La Suite se termine sur un final énergique, marqué Allegro molto (mi majeur), où le thème mélodique principal est ce que les Allemands appellent un Ohrwurm, ou ver d’oreille : une fois entendu, on ne l’oublie plus. « Je ne suis pas un compositeur », écrivait Bruno Walter avec passion dans son autobiographie, Theme and Variations (Hamish Hamilton, Londres, 1947, page 185). En effet, à l’exception d’une référence passagère à un projet d’opéra inachevé, Agnes Bernauer (entrepris alors qu’il avait seize ans), Walter attendra quelque deux cent pages de ses mémoires pour enfin aborder le sujet de sa propres musique. Personne ne semble avoir tenté de répertorier ses quelques compositions. Il évite la tâche dans Theme and Variations, comme le font ses récents biographes, Michele Selvini dans Bruno Walter: La porta dell’eternità, 1876-1932 (édition privée, Milan, 1999) et Erik Ryding et Rebecca Pechersky avec Bruno Walter: A World Elsewhere (Yale University Press, New Haven et Londres, 2001). Walter aurait apparemment pris la plume du compositeur à l’âge de neuf ans, pour produire un Duo pour violon et piano comme cadeau d’anniversaire pour son père, puis aurait poursuivi la composition dans son adolescence. Mais le gros de sa production naissante consistait en chansons dont la plupart sont désormais perdues, probablement détruites par leur créateur. Deux ensembles de six chansons furent toutefois publiés en 1901 ou au début de l’an 1902 comme Opp. 11 et 12, bien qu’au moins deux des chansons datent en fait de 1890. (La numération opus, bien entendu, laisse entendre l’existence d’au moins dix autres compositions.) En mars 1893, alors qu’il étudie encore au Conservatoire Stern, il dirige sa propre mise en musique du Meeresstille und glückliche Fahrt de Goethe pour chœur et orchestre, et semble avoir monté l’Allerseelen de Hermann von Gilm en 1896. En 1903, il écrit un Quatuor à cordes en ré majeur, interprété pour la première fois par le Rosé Quartet en novembre de la même année. Au mois de mai suivant, il dirige une Fantaisie symphonique inspirée d’Ibsen et Peer Gynt (bien qu’il plaisante de son contenu en disant qu’il est autobiographique qu’il mériterait le titre de Bruno Walter) au festival de l’Allgemeiner Deutscher Musikverein à Francfort. Cet été-là, il se met au travail et entame un Quintette pour cordes et piano et joue précisément la partie pour piano – il est excellent pianiste – avec le Rosé Quartet, pour la première fois en février 1905. De nouveau en compagnie du Rosé Quartet, il donnera la première performance de son Trio pour cordes et piano en janvier 1907. Ses deux œuvres suivantes, toutes deux écrites en 1907, figureront sur une plus grande échelle : Das Siegesfest de Schiller pour solistes, chœur et orchestre, et une Symphonie nº 1 en ré mineur, de près de 55 minutes. La symphonie sera interprétée pour la première fois au Grosser Musiksaal de Vienne le 6 février 1909, par le Konzertverein Orchestra sous la direction du compositeur. Le public adorera. La réaction des critiques sera mitigée. Six nouvelles chansons, toutes sur les textes d’Eichendorff, sont publiées en 1910. Dans Theme and Variations, Walter mentionne une Symphonie nº 2 (en mi, 1909/10) et Das Siegesfest, mais il ajoute laconiquement (page 186) « je ne tente plus de les faire jouer. Mes doutes concernant mes capacités créatives sont devenus certitudes. Seule une Sonate pour piano et violon, dédiée à Arnold Rosé, survivra à ma renonciation de la composition pendant de nombreuses années, probablement à cause de son andante que j’aime, du reste, particulièrement ». Cette Sonate pour piano et violon (on notera avec intérêt que Walter cite le piano en premier, comme il était de rigueur lorsque furent publiées les sonates pour piano de Beethoven et Brahms) fut exécutée pour la première fois le 9 mars 1909. Le style suggère une certaine habitude non seulement des sonates pour violon de Brahms (cela ne surprendra pas), mais aussi (plus étonnamment) de la musique d’un Wunderkind qui n’a encore que neuf ans, Erich Wolfgang Korngold. Walter connaissait très certainement le père d’Erich, le critique Julius Korngold qui sabrait régulièrement les compositions de Walter dans le Neue Freie Presse. En 1908, selon Julius Sternberg, autre critique viennois, Walter se serait installé dans un appartement de la Theobaldgasse, précisément sous les Korngold, où il aurait entendu le jeune Erich donner libre cours à son imagination au piano. Le premier mouvement expansif de la Sonate pour violon de Walter, marqué Allegro con espressione, démarre dans un la majeur confiant mais le développement compliqué de son motif – moulé dans une forme qui n’est pas sans rappeler une sorte d’inversion du motif du destin dans la Cinquième Symphonie de Beethoven – manifeste rapidement une instabilité tonale considérable, passant tour à tour par do, la bémol, fa dièse mineur, do dièse majeur, ré mineur, mi bémol majeur et fa dièse mineur, parfois dans l’espace de quelques secondes, avant de s’établir en la majeur. L’Andante serioso du deuxième mouvement, qui démarre en fa dièse mineur, tisse la corde à trois notes du motif qui conserve un peu de l’instabilité tonale du mouvement précédent : sol majeur, fa dièse mineur, si bémol majeur, la majeur, ré majeur, pour revenir dans un fa dièse mineur incertain. Le final Moderato part en la mineur et réussit à soutenir l’effort d’une figure descendante et déstabilisatrice et s’ouvre sur un passage marqué calmo, dans la relative majeure de do. Mais méfions-nous des calmo de Walter, car ils ne durent pas, que ce soit en esprit ou en tonalité, et un la bémol majeur précède le mi majeur avant de revenir en la mineur avec l’indication Tempo primo. Des tons plus chauds prédominent dans le reste du mouvement, sol majeur, mi majeur, si majeur, jusqu’à ce que la musique plonge dans une coda en mi mineur et revienne au la mineur dans ses dernières mesures. Bruno Walter und Karl Goldmark haben ausser ihrer jüdischen Herkunft wenig gemeinsam; sie führten zwei sehr verschiedene Leben. Goldmark wurde am 18. Mai 1830 im ungarischen Keszthely, am südwestlichen Ende des Balatonsees, als eines der zwanzig (möglicherweise sogar dreiundzwanzig) Kinder des Kantors und Rechtsanwalts Ruben Goldmark und seiner Frau Maria geboren. Nur elf der Kinder hatten bis zu diesem Zeitpunkt überlebt. Bruno Walter erblickte das Licht der Welt am 15. September 1879 in einer wohlhabenden mittelständischen Familie in Berlin. Goldmark schaffte es allen Widrigkeiten zum Trotz sich als Komponist zu etablieren; Walter besuchte das Stern Konservatorium in Berlin ab dem Alter von acht Jahren, wo er als “der kleine Mozart” verhätschelt wurde, und wandte sich in seinen Zwanzigern, als seine Musik nicht mehr seinen Ansprüchen entsprach, vom komponieren ab. Ihre Wege kreuzten sich am 2. Januar 1908, als Walter die Welturaufführung Goldmarks sechster und letzter Oper Ein Wintermärchen, nach Shakespeares A Winter’s Tale, dirigierte. Während seiner zweijährigen Anstellung als Operndirigent in Riga (1898-1900) hatte er bereits Goldmarks erste Oper Die Königin von Saba dirigiert. Im Jahre 1834 zog Goldmarks Familie, die ursprünglich aus Westgalizien kam, nach Deutsch-Kreuz, etwa siebzig Kilometer südlich von Wien und direkt an der heutigen ungarischen Grenze gelegen. Obwohl die Goldmarkschen Kinder mit der Synagogenmusik vertraut waren, machten ihre schiere Anzahl und das bescheidene Einkommen des Vaters einen systematischen Musikunterricht unmöglich; erst im Jahre 1841 wurden Kàroly (er nahm den deutschen Namen erst einige Jahre später an) musikalische Grundkenntnisse in Form von Violinstunden von einem örtlichen Chorsänger vermittelt. Sein Talent wurde jedoch sofort erkannt, und in dem Jahr darauf reiste er in die nächste größere Stadt, Ödenburg (heute Sopron, in Ungarn), um auf die dortige Musikschule zu gehen. Seine Fortschritte waren so rasant, dass sein Vater ihn 1844 zu seinem älteren Bruder Josef nach Wien schickte. Dort studierte er eineinhalb Jahre lang – bis das Geld ausging – bei Leopold Jansa (1795-1876), der der erste Geiger in Ignaz Schuppanzighs Quartett nach dem Tod des Gründers war. Keineswegs durch seine Armut entmutigt, gelang es Goldmark durch Selbststudium an der Technischen Hochschule in Wien angenommen zu werden, und darauf auch am Konservatorium, wo er bei Joseph Böhm (1795-1876) studierte. So gelangte er durch einen eindrucksvollen Lehrer-Schüler-Stammbaum in direkte Herkunft von keinem geringeren Geiger als Arcangelo Corelli: Corelli – Somis – Pugnani – Viotti – Rode – Böhm. Zu Böhms anderen berühmten Studenten zählten Joseph Joachim, Heinrich Erst, Leopold Auer, Georg Hellmesberger und Adolphe Pollitzer (der 1877 in London Edward Elgars Geigenlehrer wurde). Während der Revolutionen im Jahre 1848, die in ganz Europa ihre Spuren hinterließen, wurde das Konservatorium geschlossen, und Goldmark kehrte heim nach Deutsch-Kreuz – eine weise Entscheidung, wie sich herausstellen sollte: zusammen mit seinem Bruder Josef war er wohl an revolutionären Aktivitäten beteiligt gewesen (oder zumindest für jemanden gehalten worden, der tatsächlich beteiligt war), und beinahe erschossen worden. Er verdiente jetzt seinen Lebensunterhalt durch eine Anstellung bei dem Orchester des Ödenburger Theaters sowie durch erste Soloauftritte dort und in Buda. 1851 kehrte er nach Wien zurück um seine Technik zu verbessern und zu komponieren; gleichzeitig spielte er am Josephstadt Theater und am Carlstheater. Goldmark präsentierte sich 1858 dem Wiener Publikum zunächst als Komponist mit einem Konzert mit Kammermusik und Liedern, jedoch war die Reaktion verhalten, so dass er sich nach Pest zurückzog, um dort als Lehrer mühsam seinen Lebensunterhalt zu verdienen und sein umfangreiches autodidaktisches Studium musikwissenschaftlicher Bücher sowie der Werke Bachs, Mozarts, Haydns und Beethovens fortzusetzen. Ein zweites Konzert in Wien ein Jahr später wurde wohlwollender aufgenommen, was ihn darin bestärkte, nach Wien – diesmal endgültig – zurückzuziehen. Die Premiere von Die Königin von Saba an der Wiener Hofoper im Jahre 1875 besiegelte seinen Ruf. Sie hatte weltweiten Erfolg und war die erste deutsche Oper, Wagner ausgenommen, die in Italien aufgeführt wurde. Goldmarks Status war gesichert (trotz einiger antisemitischer Sticheleien – selbst in einem kurzen, 1902 ihm zu Ehren geschriebenem Buch von Otto Keller wird Goldmarks Familie herablassend als “israelitisch” beschrieben). Er war ein Freund von Brahms und Johann Strauss, ein angesehener Lehrer (Sibelius studierte für kurze Zeit bei ihm) und verbrachte sein Leben in Wien als eine der respektiertesten Figuren des Musiklebens der Stadt und Österreich-Ungarns im allgemeinen. Goldmark starb in Wien am 2. Januar 1915. Es könnte seltsam erscheinen, dass Goldmark so wenig für sein eigenes Instrument, die Violine, geschrieben hat, wenn nicht sein Werkeverzeichnis relativ kurz wäre. Seine bekannteste Komposition ist das Konzert in a Moll, op. 28, 1877 veröffentlicht, später ein Lieblingsstück von Heifetz und Milstein. Kleiner angelegt sind die beiden Suiten, Nr. 1 in D Dur, op. 11 (erschienen in Mainz, 1869), und Nr. 2 in Es Dur, op. 43 (Berlin 1893); ebenfalls gibt es eine Sonate in D Dur, op. 25, komponiert im Jahre 1874, veröffentlicht in Mainz ein Jahr später, eine Ballade in G Dur und eine Romance in A Dur, beide erschienen in Wien, 1913. Die Suite in D ist einfach gehalten und mit klassizistischen Impulsen komponiert, möglicherweise als Antwort auf die archaisierende österreichisch-deutsche Musik Adolf Jensens, genauer dessen Deutsche Suite, op. 36, geschrieben in den 1860er Jahren. Der englische Wissenschaftler und Komponist Harold Truscott bestimmte Jensens Werk – effektiv eine barocke französiche Suite, trotz des Namens – als eines, welches den Geist des 17. Jahrhunderts in die Mitte des 19. injiziere. Jensens Suite muss in jüngster Erinnerung gewesen sein, als Goldmark seine Suite komponierte; ob der Einfluss direkt ist oder nicht, der barocke Stempel ist in Goldmarks op. 11 offensichtlich: eine Allegro Ouvertüre (E Dur), ein Bachsches Andante sostenuto (in der parallelen Molltonart, cis Moll), ein sanftes Allegro ma non troppo (wiederum E Dur), welches das Menuett mit einem Walzer ersetzt, ein wehmütiges und recht modernes Allegro moderato quasi Allegretto (A Dur) und ein lebhaftes Finale, überschrieben mit Allegro molto (E Dur), in dem die melodische Hauptidee den Charakter eines Ohrwurms hat. “Ich bin kein Komponist” schreibt Bruno Walter emphatisch in seiner Autobiographie, Thema und Variationen. Tatsächlich dauert es etwa 200 Seiten, mit der Ausnahme eines flüchtigen Hinweises auf ein unvollendetes Opernprojekt, Agnes Bernauer (unternommen als er sechzehn war), bis Walter auf das Thema seiner eigenen Musik zu sprechen kommt. Bisher scheint niemand Walters wenige Kompositionen katalogisiert zu haben. Er meidet diese Aufgabe in Thema und Variationen, ebenso wie die beiden neueren Biographien, Michele Selvinis Bruno Walter: La porta dell’eternità, 1876-1932 (Mailand, 1999) und Bruno Walter: A World Elsewhere von Erik Ryding und Rebecca Pechersky (Yale University Press, New Haven und London, 2001). Allem Anschein nach produzierte Walter seine erste Komposition im Alter von neun Jahren, wie etwa ein Duo für Violine und Klavier als Geburtstagsgeschenk für seinen Vater, und setzte seine Kompositionstätigkeit für die nächsten zehn Jahre fort. Zunächst komponierte er hauptsächlich Lieder, von denen die meisten verschollen sind, wahrscheinlich von ihrem Schöpfer zerstört. Zwei Sammlungen von jeweils sechs Liedern wurden 1901 oder Anfang des Jahres 1902 als op. 11 und op. 12 publiziert, obwohl mindestens zwei dieser Lieder bereits 1890 vorlagen. (Die Opusnummerierung weist freilich auf die Existenz von wenigstens zehn weiteren Werken hin.) Im März 1893, als er noch Student am Stern Konservatorium war, dirigierte er seine eigene Vertonung von Goethes Meeresstille und glückliche Fahrt für Chor und Orchester; ebenfalls scheint er 1896 Hermann von Gilms Allerseelen vertont zu haben. 1903 schrieb er ein Streichquartett in D Dur, was vom Rosé Quartett im November desselben Jahres premiert wurde. Im darauffolgenden Mai dirigierte er eine Symphonische Fantasie, inspiriert durch Ibsens Peer Gynt (obwohl er scherzhaft anmerkte, dass der Inhalt autobiographisch genug sei, um den Titel Bruno Walter tragen zu können), auf dem Festival des Allgemeinen Deutschen Musikvereins in Frankfurt am Main. Im Sommer desselben Jahres begann er mit der Arbeit an einem Klavierquintett und spielte den Klavierpart – er war ein ausgezeichneter Pianist – mit dem Rosé Quartett in der Uraufführung im Februar 1905, und, wiederum mit Mitgliedern des Rosé Quartetts, gab er die Uraufführung seines Klaviertrios im Januar 1907. Die nächsten zwei Kompositionen, beide 1907 entstanden, waren insgesamt größer angelegt: eine Vertonung von Schillers Das Siegesfest für Solisten, Chor und Orchester, und eine Erste Symphonie, in d Moll, etwa 55 Minuten lang, erstmals im Grossen Musiksaal in Wien am 6. Februar 1909 mit dem Konzertverein-Orchester unter der Leitung des Komponisten aufgeführt. Das Publikum war begeistert; die Reaktionen der Kritiker waren gemischt. Sechs weitere Lieder, alles Eichendorff Vertonungen, erschienen 1910. In Thema und Variationen spricht Walter von einer Zweiten Symphonie (in E Dur, 1909/10) und Das Siegesfest, merkt jedoch lakonisch an, dass “ich nicht länger versuchte, sie aufzuführen. Meine Zweifel an meinen kreativen Fähigkeiten waren Sicherheit geworden. Nur eine Klavier-und-Violin Sonate, Arnold Rosé gewidmet, konnte meine Verstoßung mehrere Jahre lang überleben, wahrscheinlich wegen des Andante, für das ich immer noch eine gewisse Vorliebe empfinde”. Diese “Klavier-und-Violin Sonate” – interessanterweise nennt Walter hier das Klavier zuerst, was der Konvention entsprach, als die Violinsonaten von Brahms und Beethoven erschienen – wurde am 9. März 1909 uraufgeführt. Der Stil weist darauf hin, dass Walter nicht nur (kaum verwunderlich) mit den Violinsonaten von Brahms vertraut war, sondern wahrscheinlich auch schon der Musik des damals neunjährigen Wunderkindes Erich Wolfgang Korngold begegnet war. Er kannte mit Sicherheit Erichs Vater Julius, der als Kritiker Walters Werke in der Neue Freie Presse missbilligend beurteilte. Laut Julius Sternberg, einem weiteren Wiener Kritiker, zog Walter 1908 in eine Wohnung in der Theobaldgasse unterhalb der Korngolds ein, von wo aus er die Einfälle des jungen Erich am Klavier hören konnte. Der expansive erste Satz der Violinsonate Walters, mit Allegro con espressione überschrieben, beginnt in einem entschlossenem A Dur, jedoch sorgt die komplizierte motivische Fortführung – ausgehend von einem Klopfthema, welches so aussieht und so klingt wie eine umgekehrte Inversion des Schicksalmotivs aus Beethovens Fünfter Symphonie – sehr bald für eine beträchtliche tonale Destabilisierung, da durch C Dur, As Dur, fis Moll, Cis Dur, d Moll, Es Dur und fis Moll moduliert wird, bevor nach mehreren kurzen Andeutungen eine Rückführung nach A Dur erfolgt. Der zweite Satz, Andante serioso, beginnt in fis Moll und verarbeitet die drei letzten Noten der Klopffigur mit kaum größerer tonaler Stabilität als der erste Satz: G Dur, fis Moll, B Dur, A Dur, D Dur, schließlich in ein unruhiges fis Moll zurückfallend. Das abschließende Moderato beginnt in a Moll, was trotz einer fallenden Figur bestehen bleibt und dann in die parallele Durtonart C Dur während einer calmo-Passage hinüberwechselt. Jedoch bleiben weder Stimmung noch Tonart lange calmo, sondern es wird von As Dur über E Dur nach a Moll bei der Überschrift Tempo primo zurückmoduliert. In dem restlichen Satz dominieren wärmere Tonarten – G Dur, E Dur, H Dur – bis die Musik in eine e Moll Coda hineinsinkt, die in den Schlusstakten nach a Moll zurückkehrt.